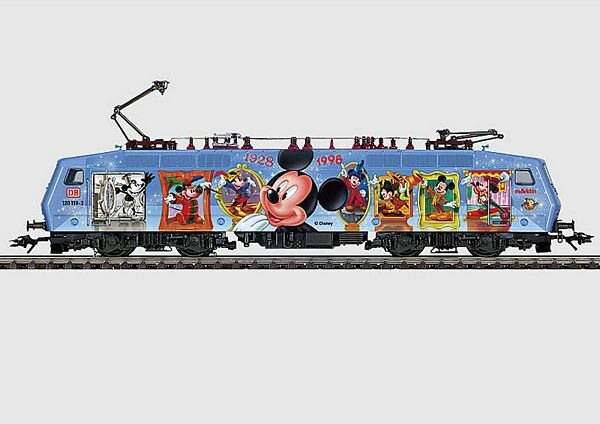 Model: Electrical locomotive "Mickey mouse". Wheel arrangement Bo ' Bo '. Black casting chassis, a propelled rotary stand, black chassis, digital high-power engine. Plastic housing, light blue, roof partly red and shaded, red railway emblems, black labels, operating No. : 120 119-3, red "Marklin" signatures, completely multicolored illustrations of Walt Disney's "Mickey mouse", red years "1928" and "1998", assigned windows, set grab irons, three-light point signal reciprocally, light changes with change of direction, point signal digitally adjustably.